George Street Waterbeds is a leading waterbed supplier and retailer in the UK, specialising in AKVA waterbeds. They have an excellent reputation nationally and are a member of the British Waterbeds Association. Develop a website that aims to expand the business by extending the reach to new potential customers globally. Prepare the website for exposure via natural search engine listings. Limited online marketing experience and budget. 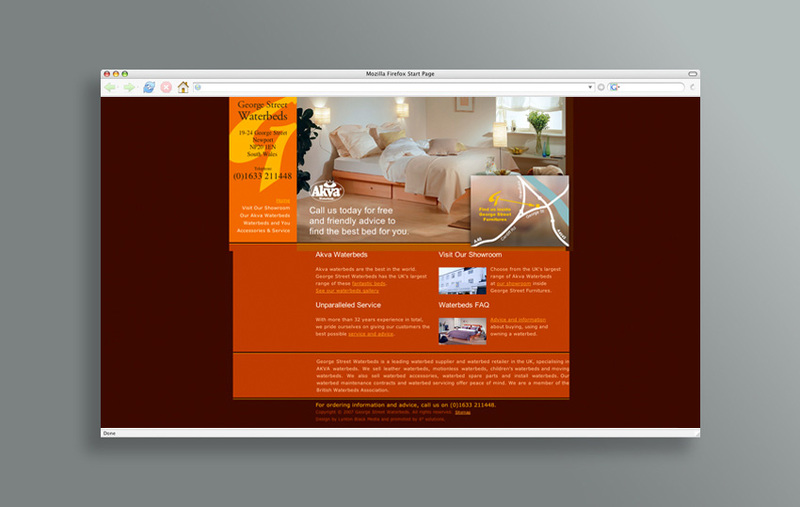 Optimised the website for the major search engines. Ensured the customer journey through the site are at peak level. Analysed and reviewed the competitor websites. Tracked the website and provided comprehensive keyword & ranking analysis and reporting. Results have been fantastic. The website has consistently been ranking on page one of Google since December 2007 for keyphrases such as ‘AKVA waterbeds’, ‘waterbeds for sale’ and ‘waterbeds retailer’. Business has increased dramatically and the online marketing investment has yielded an enviable return. International web enquiries and new orders have sharply increased. Due to the excellent results, the client is looking to invest more marketing budget in other marketing initiatives.